Source: For Review From Teenreads! Goodreads Synopsis: Jo Montfort is beautiful and rich, and soon—like all the girls in her class—she’ll graduate from finishing school and be married off to a wealthy bachelor. Which is the last thing she wants. Jo secretly dreams of becoming a writer—a newspaper reporter like the trailblazing Nellie Bly. These Shallow Graves was such a complex, rich historical novel that brought me back into reading. Everything about it, from it's quirky, emotional characters to a dark plot had me racing through the pages. I read Donnelly's other novel, Revolution, and loved it. It was great knowing These Shallow Graves lived up to my expectations! The novel circles around the Victorian era. Girls forced into arranged marriages. The corrupt media spreading lies. The powerful men dominating the social classes. Donnelly creates such a rich and detailed setting, I was automatically drawn into it. The protagonist, Joe Montfort is from a rich, well-established family. She has big dreams to become a new reporter, but as her father's fatal death comes crashing into her life, that dream is far from reality. Her dad's death instantly sets the dark, suspenseful tone of the novel. I greatly enjoyed how Donnelly took the type to establish Joe and her motivating and strong personality within the first few chapters. As Joe searches for the answers to whom killed her dad, she meets Eddie Gallagher, a new reporter, someone she would never see herself talking with. Or much less fall in love. Joe and Eddies were great foil characters for each other. Joe is such a determined and strong willed character she balanced out Eddie's whimsical, caring attitude. The novel delves upon dark secrets hidden within Joe's world, but also the world Eddie comes from. While Donnelly's idea is not new, she presents it in her own way and provides a twist that I never saw coming! The novel definitely kicked up as Joe and Eddies uncovered clues pertaining to her dad's killer. Joe and Eddies go through many emotional journeys from Joe's arranged marriage with Bram to a close betrayal from a family member, you can't help but be in her shoes. Another great thing was that Donnelly did not circle the whole novel around them. It was all about the killer and uncovering her family secrets. The romance between it all added to the emotional appeal of the novel and added a great depth to the novel. In all honestly, I believed Donnelly could have sped up on revealing who the killer is. 496 pages was a lot and she could have produced a much stronger novel with fewer pages. Some chapters just dragged me down and I felt like it didn't contribute to the novel as a whole. 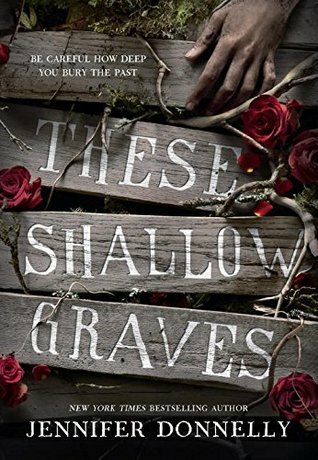 Ultimately, These Shallow Graves is one of my favorite historical YA novel from this year! Donnelly is back with a richly drawn novel filled with complex characters and a killer that will have you on the edge of you seat! I think Revolution got my expectations WAY up. I enjoyed this, but I agree that it dragged at times. Star Wars Force Arena Hack Crystals and Credits will allow you to buy all cheats (resources) items for free no cost. Below you will see all the cheats needed to Generator Star Wars: Force Arena. Always look at the platform before buying a game for your computer. If you own a computer made by Apple, for example, you cannot run a PC game on your system. Particularly, if you aren't paying attention, it is easy to make this mistake. Invest an extra minute in the buying process to determine that you have the right version of the game. Avoid buying the costly edition of games, unless they are a favorite. Many times, Fortnite hack games will have a special edition, but it isn't necessary to have in order to play the game. By not purchasing the special edition you can save money on the hack Fortnite game and still enjoy it.